It used to be that the bus stop I would got to to get home from the city centre was the first on the route. would be qued up beside the Screen Cinema. I could see the bus waiting to leave and and they would leave fairly promptly, occasionally there would be a crowd at the stop but the pavement was pretty wide. 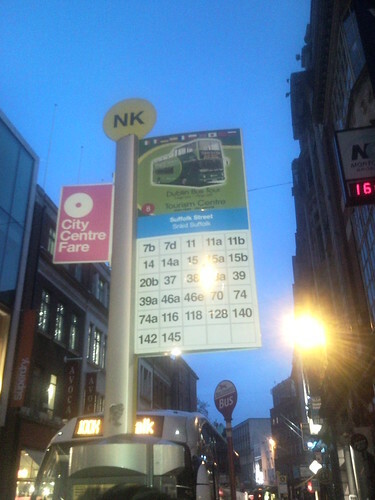 Then the Dublin bus network review happened and the closed bus stop to home is Suffolk Street and as you can see from the stop shared with a lot more buses, and the Bus Eireann stop is before it and the Air coach intercity stop is after it. The pavement is very very narrow, you’d not get 3 people standing abreast on it. 3 bus lengths from the stop due to other buses being there already and by the time I got through the crowds to it the diver had closed the doors and was pulling of. I really don’t consider this an improvement. Previous PostBut is it art?Next PostFirst steps.